The multi-million dollar troubles for an embattled American guardrail maker have extended north of the border as a Canadian city filed a lawsuit this week over the company’s allegedly dangerous and “defective” guardrail design. The complaint, obtained by ABC News, seeks half a billion dollars in damages on behalf of the city of Stratford, located in Ontario, Canada and alleges Trinity Industries of Dallas, the manufacturer of the ET-Plus guardrail system, "misled its customers" by not disclosing "secret” modifications it had made to its product. "Trinity was aware of multiple serious failures of their secretly modified ET-Plus guardrail end terminals, but continued to manufacture and sell the modified version without disclosing the changes, resulting in tens of thousands of the units being installed across Canada," the complaint reads. "It is believed that there are tens of thousands of these defective, secretly modified, ET-Plus guardrail end terminals on the highways, as well as provincial and municipal roadways, across Canada." The ET-Plus guardrail system, which is used in states throughout the U.S., was the subject of an ABC News "20/20" investigation last year. ABC News obtained an internal Trinity email from 2005 in which a Trinity official estimated that making a modification to its widely-used guardrail system -- reducing a piece of metal in the end terminal from five inches to four -- would save the company $2 per end terminal, or $50,000 a year. Trinity made the modification that year without alerting U.S. federal or state officials and critics have since blamed the change for rendering the end terminal defective when hit, sometimes impaling vehicles and causing severe injury or death. The company has maintained that the modified ET-Plus is safe and continues to meet federal standards. News of the complaint from Stratford, which happens to be the hometown of pop star Justin Bieber, was first brought to light by Trinity itself in an annual shareholders report just filed by the publicly-held company in which it disclosed pending litigation. "The Statement of Claim in this litigation generally alleges that Trinity Industries, Inc., Trinity Highway Products and Trinity Industries Canada, failed to warn of dangers associated with undisclosed modifications to the ET Plus guardrail end terminals, breached its implied warranty, breached its duty of care, and was negligent," the Trinity earnings report reads. Trinity spokesman Jeff Eller would not comment on the complaint and told ABC News the company has not yet officially been served. The Canadian complaint is the second of three class action lawsuits filed against Trinity surrounding the ET-Plus system. In November, a class action complaint was filed in Illinois on behalf of the counties in that state, alleging fraud on the part of Trinity for not disclosing the modifications. And earlier this week, a class action complaint was filed in Wisconsin, also alleging the company was fraudulent in selling the altered ET-Plus to transportation departments. In its latest annual report, Trinity Industries acknowledged that 42 U.S. states have now suspended use of its ET-Plus. The company halted sales late last year, pending results from U.S. government-mandated crash tests of the end terminal. Those tests, ordered by the Federal Highway Administration (FHWA), were conducted in December and January, in order to determine the ET-Plus’ eligibility to remain on U.S. highways. The product passed the first series of four tests and results of the final four are awaiting release by the FHWA. Controversy has dogged the eighth and final test, which some say show a clear failure of the end terminal. Helicopter footage shot by a local ABC station shows the guardrail system caused substantial damage to the test vehicle upon impact. Trinity Industries has insisted no conclusions can be drawn from the video alone. 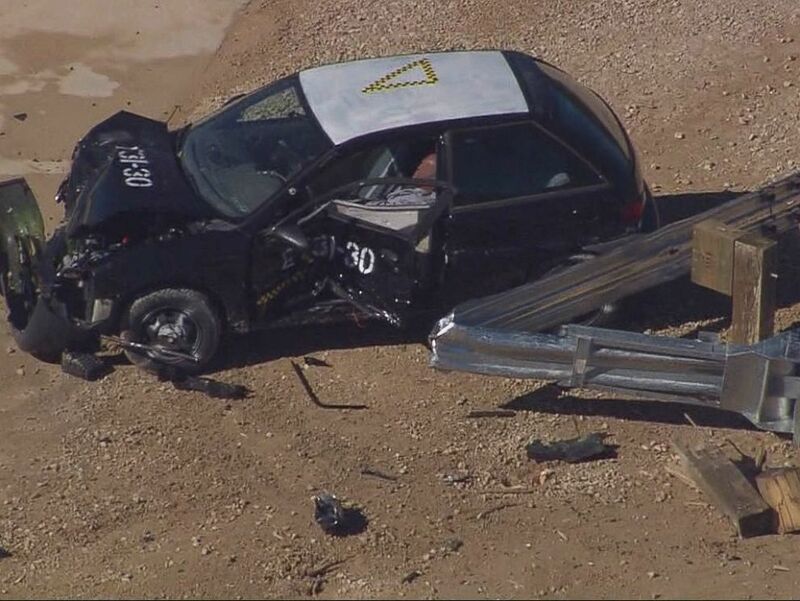 Helicopter footage shows the eighth crash test of the ET-Plus guardrail system. And in a rare move by the normally circumspect company, a Trinity executive used a recent earnings conference call to publicly blast two of the most vocal critics of the crash tests and of the ET-Plus system, Josh Harman and Dean Sicking, as having financial motives for speaking out against its product. "We expect Mr. Harman and Dr. Sicking will continue their campaign to discredit the ET-Plus and Trinity Highway, ignoring facts and data that confirm the ET-Plus system complies with applicable regulatory requirements," Theis Rice, Trinity's chief legal officer, told shareholders Feb. 19. Harman is a one-time competitor of Trinity Industries who battled the company first as the defendant in a patent lawsuit and later as a plaintiff and whistleblower in a federal case accusing the company of fraud. Harman first brought news of the undisclosed modifications to the government in 2012. A jury found Trinity liable in the federal case and the company was ordered to pay $175 million, which could triple by statutory mandate. The company plans to appeal the verdict. In the call to shareholders last week, Rice painted Harman as an opportunist who has used the media to make unsupported accusations. "Should Mr. Harman ultimately prevail in his litigation, he stands to receive somewhere between 20 percent and 30 percent of the monetary amount awarded upon final judgement,” Rice said. Rice also called out Dean Sicking, a renowned highway safety engineer and guardrail expert who invented the predecessor to the ET-Plus and who has openly criticized the methodology used in the crash tests. "Dr. Sicking has developed, licensed and is currently receiving royalties on end terminal products that compete directly with the ET-Plus. We believe Dr. Sicking stands to gain financially by discrediting the ET-Plus," said Rice. The embattled company has not been known to speak so bluntly of its critics and in responding to ABC News Wednesday, Harman said he believes it is a strategy as the results of the final tests - including the controversial eighth test - await release by the government. "It's just another attempt by Trinity to divert attention from the [federal jury] verdict and the fact that one or more of the crash tests recently performed by Trinity at the FHWA's directive failed," Harman told ABC News. Sicking, who is currently conducting football helmet safety research at the University of Alabama-Birmingham, insisted that money is not his incentive for speaking out, noting that he has proposed reinstating an earlier version of the ET-Plus that would actually cut royalties he receives from competing products. "It is easy to see that any greed present in this argument is on their side," Sicking told ABC News, adding that he has been the victim of "vicious attacks" in the "battle to do what's right."